After you create and customize your map, you can add figures to it. This option is very useful if you want to highlight the certain area on the map. 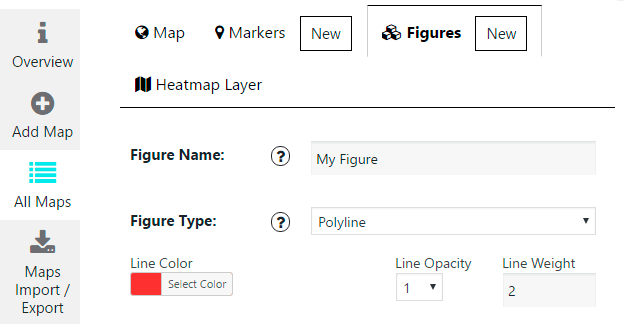 To create a figure go to Figures Tab and click “New” button. Figure Name – the title of your figure. Figure Type – “Polyline”, “Polygon” and “Circle” types are available. With Polyline type you can create a series of straight segments on the map, whereas with Polygon type you can choose the certain area enclosed by a closed path (or loop), which is defined by a series of coordinates. With Circle type you can create round figure with different size and opacity to mark the area you need. Line color, Line opacity and Line weight. For polygon and circle types there are also fill color and fill opacity. 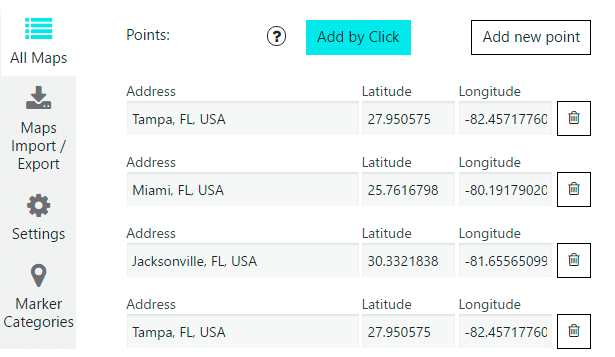 Figure’s points list – you can search the point by address (just start typing in Address field), type the Latitude and Longitude of point in appropriate fields or activate Add by Click button, and then draw figure on the map by clicking on it. Important! You must deactivate Add by Click button after ending of the draw. Don’t forget to press the “Save Figure” button after you change the figure settings. Every change of figure you can immediately see in a live preview in the right top corner.